Do you have a minute to spare to learn some English? 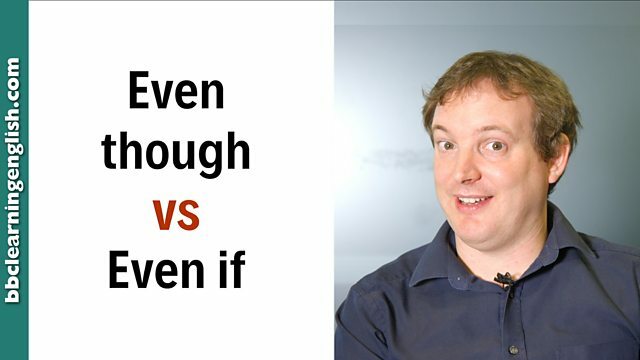 Let Phil explain the difference between even though and even if! Give us 60 seconds and we'll give you the English! Hi, I'm Phil from BBC Learning English. Today, I'm going to tell you the difference between even though and even if. Now, we use them both for emphasis but they don't mean the same. We use even though to introduce something that's true, but might be a little bit unexpected. It's a bit like despite. Even though I hate driving, I'm still going to Scotland by car. Even though I hate tennis, I'm still going to watch the final. We use even if to introduce something hypothetical, so it might not be real. Even if it's sunny when we're in Scotland, I'm not going swimming. Even if you paid me, I wouldn't watch that film. So, even though is for things that are true but unexpected, and even if is for things that are hypothetical, so they might not be real. Even though they look the same, they are different – even if you didn't notice at first! Even though introduces something that's true, but may be unexpected. It's similar to despite. Even though I hate driving, I'm still going to Scotland. Even though I hate tennis, I'm still going to watch the final. Even if introduces something hypothetical, which means it may not be real. Even if you paid me, I wouldn't watch that film. Is this sentence real and possible or hypothetical? Which of these is 'even though' similar to? Are these future plans almost definite or do they sound like they are probably, but may not happen? Which of these sentences is real?